What’s that passing in front of the Sun? It looks like a moon, but it can’t be Earth’s Moon, because it isn’t round. It’s the Martian moon Phobos. The featured video was taken from the surface of Mars late last month by the Curiosity rover. Phobos, at 11.5 kilometers across, is 150 times smaller than Luna (our moon) in diameter, but also 50 times closer to its parent planet. In fact, Phobos is so close to Mars that it is expected to break up and crash into Mars within the next 50 million years. In the near term, the low orbit of Phobos results in more rapid solar eclipses than seen from Earth. The featured video has been sped up — the actual transit took about 35 seconds. 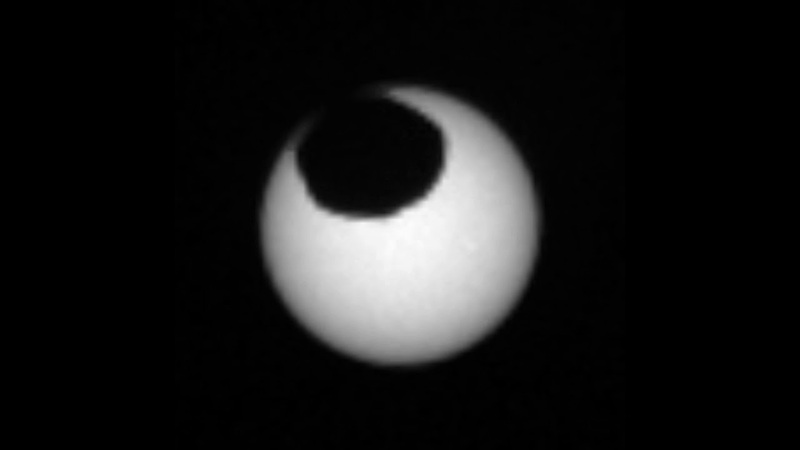 A similar video was taken of Mars’ smaller and most distant moon Diemos transiting the Sun. The videographer — the robotic rover Curiosity — continues to explore Gale crater, most recently an area with stunning vistas and unusual rocks dubbed Glen Torridon. Posted on Wednesday, 10 April 2019 by VGC	This entry was posted in ifttt-photograph and tagged IFTTT, NASA. Bookmark the permalink.